This map shows all Yorkshire mill towns ( ). 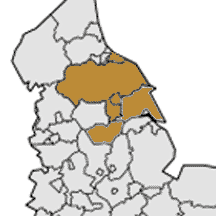 That is, all settlements in Yorkshire that developed around one or more mills. It also includes any town with one or more mills enlisted in the English Heritage. On clicking an icon you will obtain a list and an individualized map with the mills in town. On mouse over it shows the townâ€™s name, the country and the number of enlisted mills and other industrial heritage buildings. This information is also available on an alphabetical list ordered by countries. You can also go to a per country map: West Yorkshire, South Yorkshire and North Yorkshire.